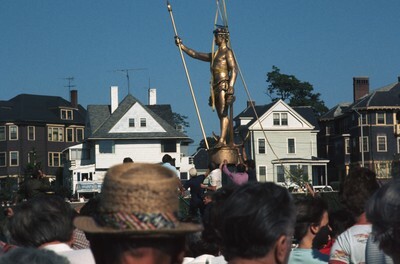 On 20 July 1976 the “Independent Man” statue, which sits atop the Rhode Island State House, was returned after spending a year being repaired and receiving a new coat of gold leaf. He also spent some of that time at the Warwick shopping mall. This was the only time since 1899 that the statue was removed from it’s perch. Smolski, Chet, "Rhode Island Independent Man" (1976). Smolski Images. 207.